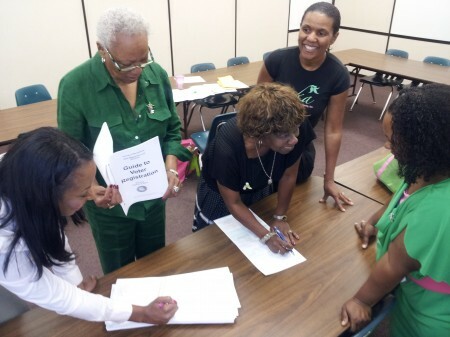 Alpha Kappa Alpha Sorority, Incorporated (AKA) will be hosting local Voter Registration Drives throughout Elk Grove and Sacramento. The Sigma Delta Omega chapter (SDO), located in Elk Grove, and the Eta Gamma Omega (HGO) chapter, located in Sacramento, are collaborating to register as many people as possible to vote. On September 9th, the two chapters hosted a voter registration drive at the Service Employees International Union (SEIU) event, held at the Elk Grove Regional Park. The leadership within SEIU spoke to SEIU members about the importance of voting and issues that affect the working class population. This effort has culminated in SDO extending invitations to collaborate with the Northern California Pan-Hellenic Council, Sacramento State University Black Alumni network, California Association of Black Social Workers and the Senior Fellows of the Nehemiah Emerging Leaders Program. Members of these organizations will host voter registration tables outside both Antioch Progressive Church and Center of Praise Ministries. This event is not limited to church attendees; all non-registered voters are encouraged to use this event as a convenient way to get registered in time for the election. The deadline for voter registration in California is October 22.